If you were any closer to scenic Broad Creek, you’d be standing in the water. Voted one of the “Top 100 Scenic View Restaurants” by OpenTable, Old Oyster Factory is among Hilton Head Island’s finest waterfront eateries, providing accommodations to fulfill an outstanding dining experience for all kinds of guests. Couples and small groups can enjoy a sunset dinner while taking in the panoramic views of Broad Creek; families with children are welcomed and can have fun with Ben from “Juggle Stuff” on the back deck; large groups of up to 400 can be accommodated, and there are two rooms that seat 60 people. During the summer months, everyone can enjoy the fireworks display from Shelter Cove, which can be seen from the restaurant on Tuesday nights. The diversity of guests and accommodations extends to the variety of food selection on the menu. A popular menu item is the Seafood Medley, which is a signature combination of broiled seafood, featuring favorites such as wild caught local shrimp, day boat scallops, Chef’s fresh catch, an oyster Savannah, and an oyster Rockefeller finished with Chef’s sauce du jour. And if somehow that’s not quite enough to fill you up, you’ll also get garlic Parmesan rice and vegetables on the side. Entrée standouts include grilled key lime salmon, almond encrusted, Lowcountry boil, seafood pasta, whole live Maine lobster, and more. 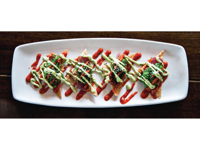 The appetizers include a broad range of seafood cuisine, such as smoked salmon, crab cakes, calamari, bacon-wrapped shrimp, and “Low Country Caprese,” which is fried green tomatoes with goat cheese and a roasted red pepper and basil cream. And of course you will find a variety of oven baked oysters. Getting hungry yet? But there’s more to the menu than just mouth-watering seafood. Guests can order from Old Oyster Factory’s “Steakhouse Selection,” where they can choose from NY strip, filet mignon, ribeye, center cut pork chop, and surf and turf. Old Oyster Factory patrons begin their evening with dinner overlooking Broad Creek. Although the food and scenery get the spotlight, the pearl of the oyster that can be found here may be the restaurant’s rich history and tradition. 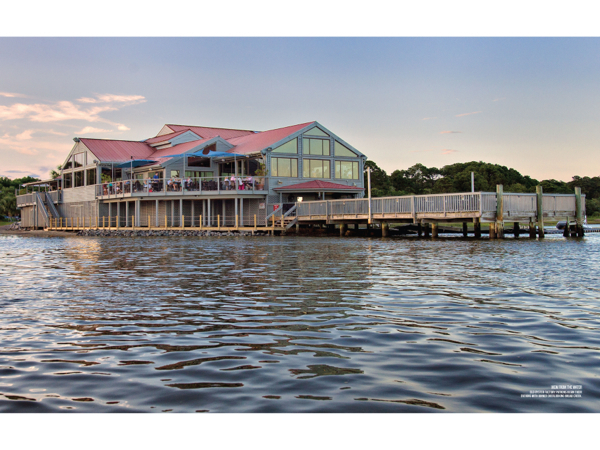 Old Oyster Factory has been a favorite dining destination on Hilton Head Island for 25 years. Manager Jessica Lemek has been an employee of the restaurant since nearly the beginning. “I’ve been here for 23 years and I love it just the same as if I had started working here yesterday,” she said. The core staff, which according to Lemek has been a unit for more than 10 years, is more than just a group of people with a workplace in common. “I feel like I’m working with my family, which includes our employees as well as our regular guests. And we bring back the same college kids for work every summer,” Lemek said. 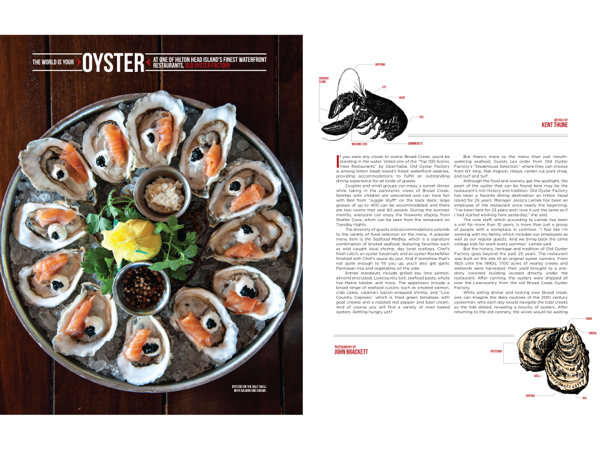 But the history, heritage and tradition of Old Oyster Factory goes beyond the past 25 years. The restaurant was built on the site of an original oyster cannery. From 1925 until the 1990s, 1700 acres of nearby creeks and wetlands were harvested, their yield brought to a one-story concrete building located directly under the restaurant. After canning, the oysters were shipped all over the Lowcountry from the old Broad Creek Oyster Factory. While eating dinner and looking over Broad creek, one can imagine the daily routines of the 20th century oystermen, who each day would navigate the tidal creeks as the tide ebbed, revealing a bounty of oysters. After returning to the old cannery, the wives would be waiting to finish the work by shucking hundreds of fresh oysters daily and then canning them with their sweet juices. The oysters were then ferried across to the mainland where they were distributed from Savannah to Charleston and beyond. To this day, small family-owned boats can still be seen navigating eddies off of Broad Creek, continuing the tradition of generations. And names like Mitchell and Pinckney, descendants of the original working oyster families, grace nearby mailboxes. Today’s Old Oyster Factory is a Hilton Head Island restaurant experience that is not to be missed. There’s something for parties of all sizes and family and children of all ages. 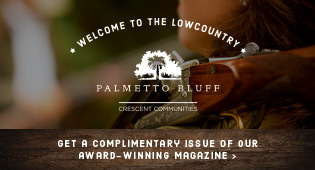 You can enjoy fresh caught seafood and wide range of steaks and delicious desserts while taking in one of the best panoramic views of the marshland landscape in the Lowcountry. Old Oyster Factory is located at 101 Marshland Road, Hilton Head Island. Dinner is served starting at 4:45 p.m., seven days a week. For directions or more information, visit oldoysterfactory.com, or call (843) 681-6040 for reservations.